Club Penguin Cheats by Mimo777 Club Penguin Cheats by Mimo777: Club Penguin January Membership Page! mimo r u a member?? Yes, Mimo is a member. mimo the telescope at the lighthouse in it the migrator is far away. 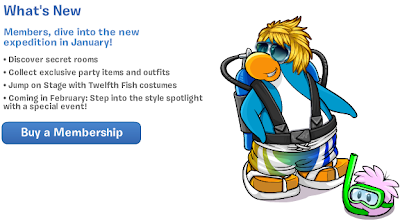 NEW PUFFLE!! and the color is hot pink! :D :D it will be discovered at this party!! i went to the dojo to catch up on my ninja skills and guess what i saw! If you look up at the top windows you can see three ninjas jumping about and then disappear. Oh and mimo. You can only see the ninjas once. I waited for a while for them to come back but they didn't. Then I went outside and then went back in but they didn't appear. Be sure to catch them! Actually they do appear once in while but you have to have alot of patience for them to appear again! there will be hot pink puffle there. Hey guys I chille001 am not a member at all. Mimo already postd about this. Sorry! mimo theres something wrong with club penguin. i dont know if club penguin has a problem on ur computer but mine has a problem. When you get to the home page (since i use google crome) it would say sorry google crome couldnt find clubpenguin.com also on the regular internet it would say address not found. I am so freaked out right now. Dont tel me their domian experied again. mimo do you have any pictures of rooms in the underwater party and stuff? cuz you had some for the holiday party and they were correct!! Mimo posted it on November 24th, 2011 at 1:04 AM. The post recieved only 1 comment. we can to do stuff like me i'm a rare penguin i can do alot of stuff. exactly braceface! when did mimo post about the ninjas huh? I'm sorry ok? I didn't know that he posted that. Don't get all huffed up just because you were right. I don't want any more mean comments posted ok? I admit I was wrong but don't go around posting "See I told you I was right." Well, I don't like being challenged, and you don't have to be so rude about it either. If you don't respect me, then you won't get respect back.